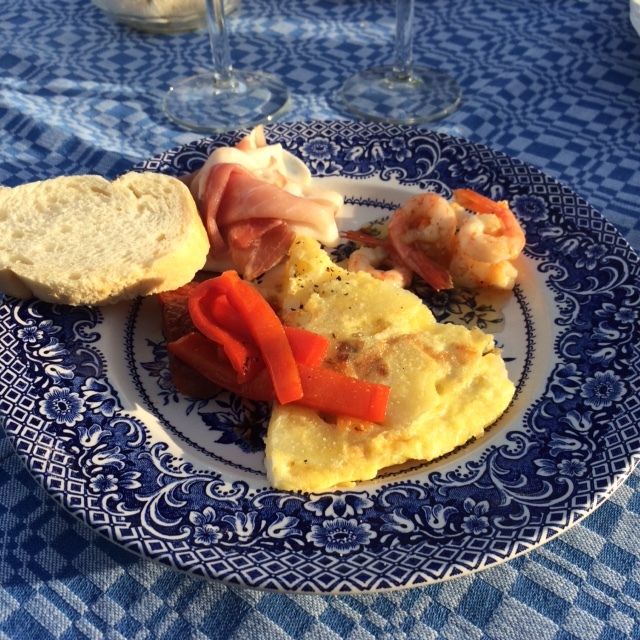 We had some wonderful summer evenings in Sweden and on one of them, we pretended we were in Spain, eating a few homemade tapas dishes. Washing it down with a glass of rosé it was easy to imagine us being near the Mediterranean, instead of the Baltic. 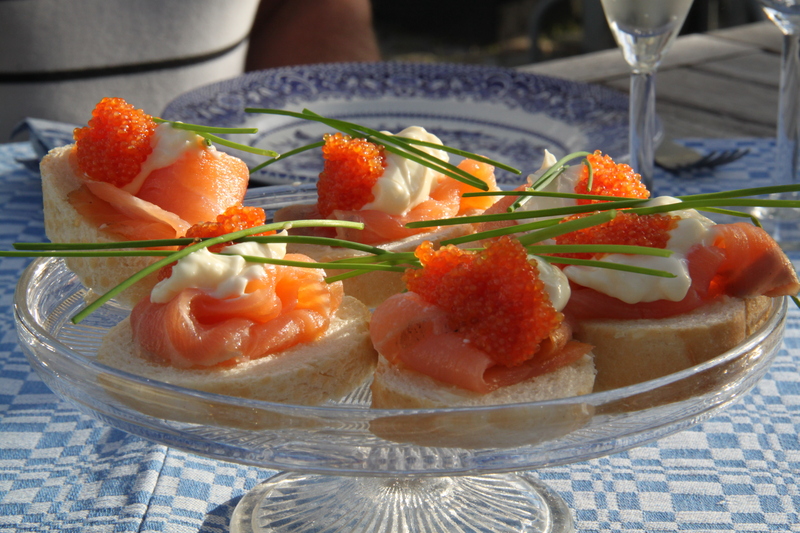 We started with a few pinxtos with salmon and mayonnaise. I’ve eaten many of these in Spain, but they look a bit different in the Basque pinxtos bar, with the salmon chopped and mixed in with the mayonnaise. Flavour wise they’re the same though, and the reason I skipped the shopping was because I was already hangry and prolonging the intake of food would just make matters worse. I also made my first ever tortilla! It tasted wonderful, but it’s much flatter than they usually are because I halved the recipe as it was for 6 people. I recommend you make the full recipe so it looks proper though, and the leftovers are yummy to eat the following day too. My dad LOVES chorizo so we decided to fry some and serve it with soft peppers in oil. This worked perfectly together with the eggy tortilla. Another favourite of ours is the garlicky prawns we order every time we have tapas. This was the first time I made them at home and thought they tasted ‘right’, which just proves how good the cookbook I found the recipe in actually is. Large prawns are best for this dish, but as Sweden has lots of the smaller cold water prawns we used mainly those and it still tasted great! We also had some other nibbly bits like olives, cured ham (sadly not Spanish Jamon but prosciutto works too) and pickled garlic. I had the intention of making ham croquetas as well but they take a while to make and we were out and about during the day. Instead I made them the day after as a starter and they were divine. Recipe to follow in a separate post. Adapted from Tapas Revolution by Omar Allibhoy. Thinly slice the potato halves, cut side down. Do the same with the onion. Pour the olive oil into a deep frying pan and add the thinly sliced onion. Place over a high heat. Once the onion starts to sizzle (this should take about 5 minutes), add the sliced potatoes. Cook for about 15 minutes, stirring from time to time, until they are soft and cooked through. The potatoes and onions should have browned on the edges. Remove the potatoes and onions from the pan and set aside. Break the eggs into a large bowl but don’t whisk them. Add the hot potatoes and onions to the eggs season with salt while the potatoes are sitting on top. Carefully mix through; use a fork to break up the eggs but don’t over-mix – just give the mixture a few loops with a fork. If you can, leave the mixture to rest for half an hour to allow the flavours to develop. 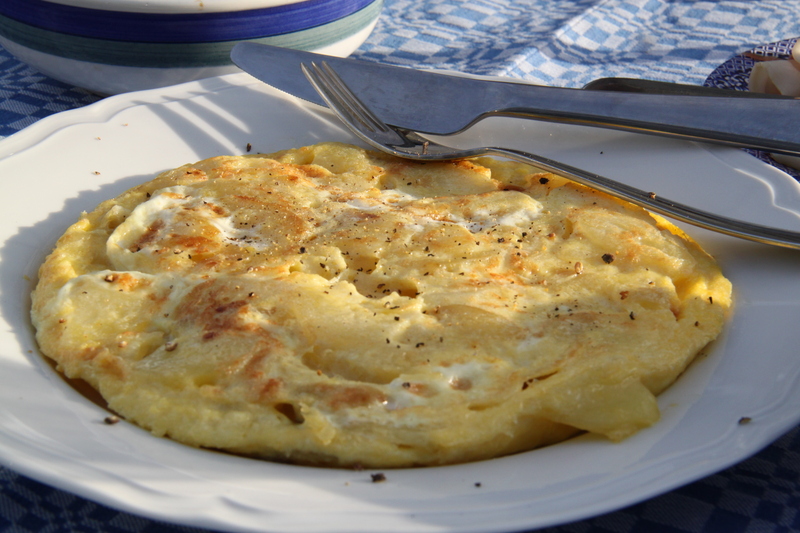 To make the tortilla place a non-stick pan over a medium heat and add a drizzle of olive oil. When the pan is hot add the egg mixture. Do not stir the contents of the pan! After about 3 minutes you should be able to ease the tortilla from the edge of the pan using a spatula. At this point, cover the pan with a plate (it needs to be larger than the pan). Hold firmly with both hands and flip the pan over on to the plate. Slide the tortilla back into the pan for the other side to cook. Place back on the heat for another 2 minutes (the inside will then be a little runny, but if you want it cooked through, just lower the heat and cook for a few more minutes). 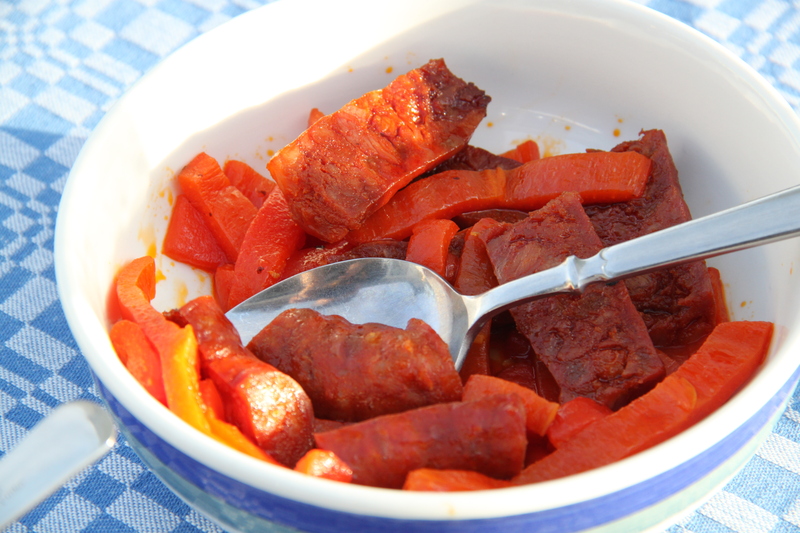 Remove the skin on the chorizo and cut into 7 cm long pieces. Cut in half lenthways and fry for about 5 minutes on both sides in some oil. Drain the peppers and cut into strips. Add to the chorizo in the pan until warm. Transfer to a bowl and serve. Peel the prawns and sprinkle with salt. Add oil, garlic and chilli to a frying pan and place over high heat. 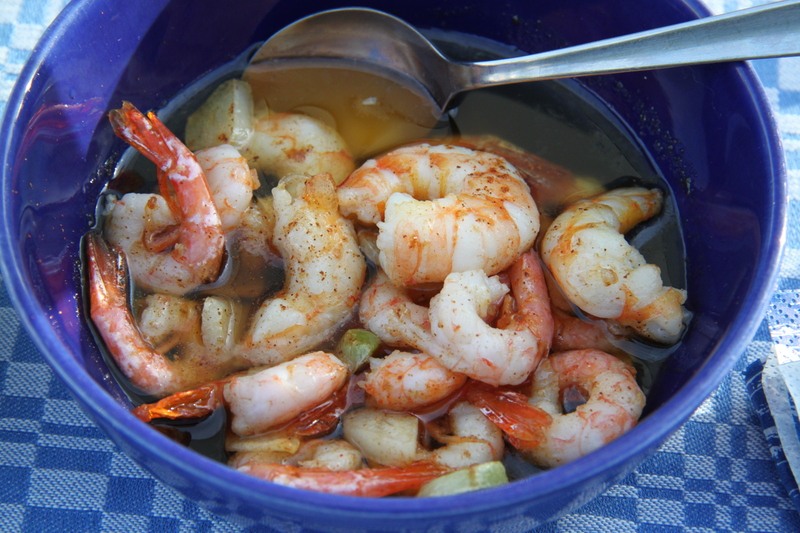 When the garlic starts to turn golden, add the prawns. Cook for 1 minute on each side, until they just turn pink. Sprinkle with chopped parsley and served immediately in a bowl. Preferably with some bread to dip in the lovely oil. I really like this kind of lighter dishes for my supper. It’s still cooked food so feels like a proper dinner, just not as heavy. 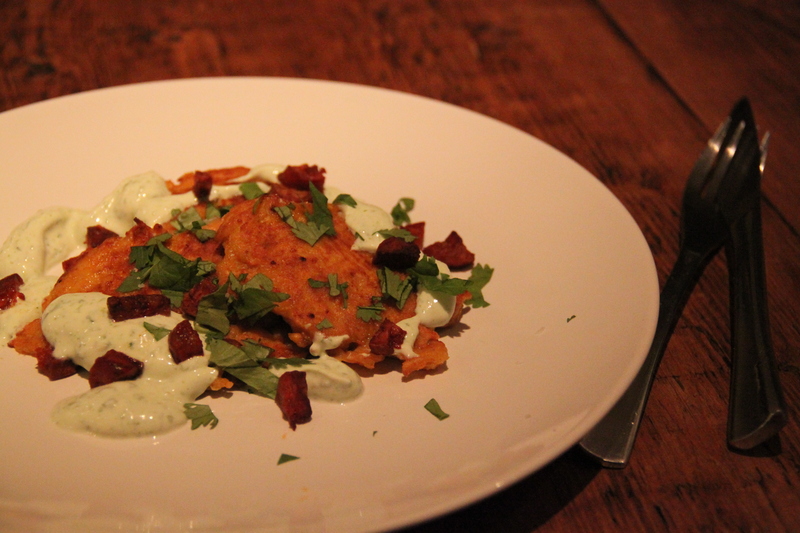 The coriander yoghurt is a nice, fresh contrast to the sweeter and earthier flavours of the fritters. Get in! Mix yoghurt and coriander with a blender. Add olive oil. Season to taste with lime juice, salt and pepper. Mix eggs and flour in a bowl. Add the milk and whisk until no lumps. Add the grated sweet potatp, spices, salt and pepper. Fry in butter and oil on medium heat until golden brown and cooked through. Remove and fry the chorizo pieces until crisp. Plate up and serve with the coriander yoghurt and chopped coriander. This simple yet very tasty dish was my supper on Sunday night. I kind of forgot about supper until it was half past eight and by then I couldn’t really be bothered to make anything time consuming as Homeland was about to start at nine. And luckily the oven pretty much cooks this for you. Just a little chopping required from the cook. The combination of sweet, salty and spicy is always a winner but especially during the colder months as it really warms you up from within. Wash the squash, cut in half lengthways and scoop out the seeds. Cut into large chunks, keeping the skin on. Drizzle with olive oil in an ovenproof dish and season with cumin, smoked paprika and a little salt. Roast in 200C for 20-30 minutes or until soft. 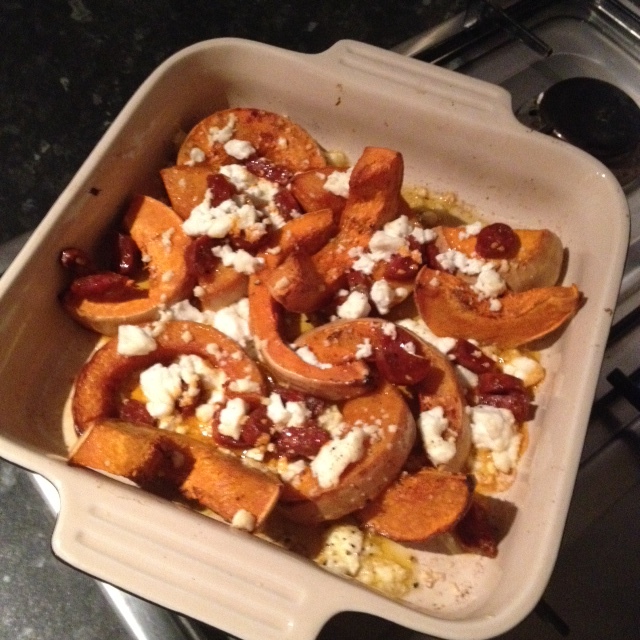 Add the chorizo and crumbled feta to the dish and put back in the oven for a further 10 minutes. Serve immediately.